When it rains, it pours. Autumn is when all the best gift with purchase offers, beauty boxes, and Advent Calendar collections come out. Just take all my money already! Space NK Apothecary's Autumn 2017 Beauty Bag is available worldwide as a gift with purchase of products worth £175, when you use code AW2017 at checkout. Delivery is free. The exclusive bag is ethically made out of eco-friendly, reusable materials. It is designed by British designer Giles Deacon (for the uninitiated, he designed Pippa Middleton's wedding dress), and shows a barbed wire against a pink backdrop. There are 22 products inside, and the bag is worth more than £250. 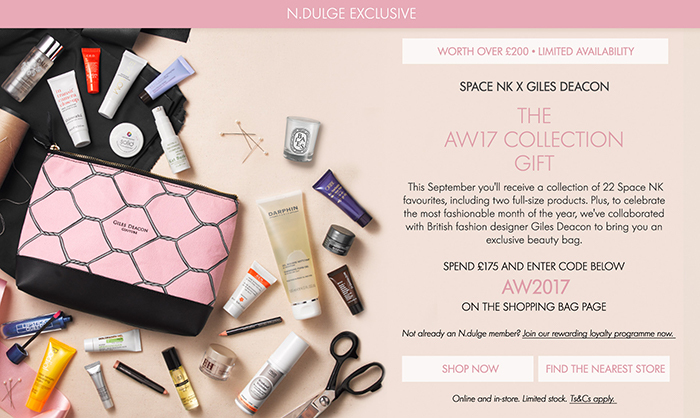 Scroll down for the full contents of the Space NK AW17 Beauty Gift Bag by Giles Deacon. 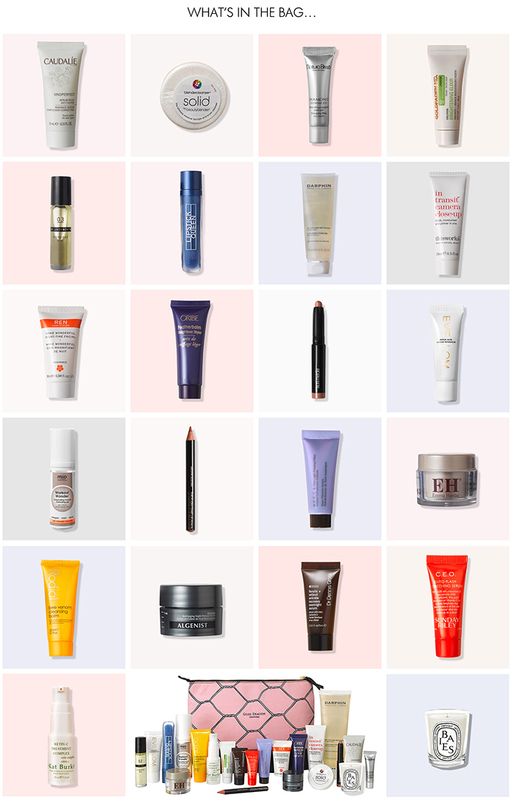 True, this GWP is very skincare-centric. But there are some recent launches and big names in here. I badly want to try the Sunday Riley CEO Serum - this bag is actually serum-centric. There are six in here. I'm also excited about the Kat Burki Retin C and the Rodial Cleansing Balm - who even knew they had one? I'm thrilled to find so many new launches in this bag, and the bag itself is fab. I would have liked to see the last of yet another Lipstick Queen colour-changer, but no biggie; I can always give it away. Everything else, I can use. I'm particularly pleased at not having fake tan in here. Overall, this one is a great GWP and meets Space NK's high standards. For those who live outside of the US and end up feeling jealous of some of their great Fall offers, Space NK's UK arm - and Cult Beauty, Beauty Bay, Harrods, Harvey Nicks, Feelunique, and so many other retailers including Barneys - ship their gifts with purchase offers worldwide! You can get the Space NK AW17 GWP free here, when you shop for £175, using code AW2017 at checkout. 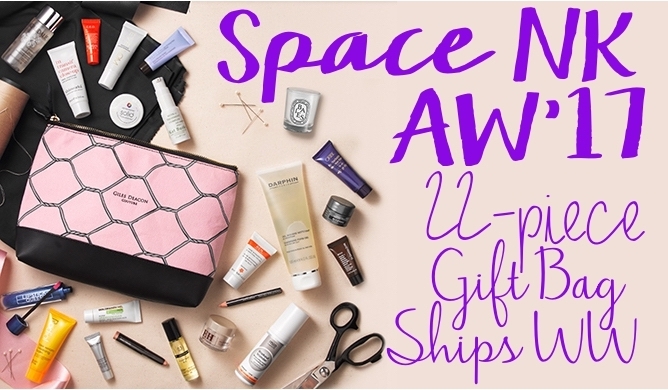 The Space NK GWP bags ALWAYS sell out in a couple of days, so you might want to get a head start.